Earliest possible Japan for Europe pressing but with the stylized font instead of the crude. 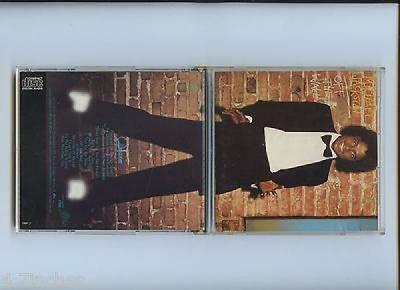 "35 8P-2-6 and 1B3" and "Manufactured by CBS/Sony Records INC" in stacking area. Unique artwork with the blue Quincy Jones logo on tray card and rear of booklet. Original smooth sided case with two wide stoppers "Patent pending" and "1" in lower rear right corner. CBS / Sony Records opened the first commercial compact disc pressing plant in April 1982 in Shizuoka Prefecture, Japan. Production of commercial CDs got underway in mid-September, and the compact disc was launched in Japan on October 1, 1982. 5$ for 1st CD - for each additional CD add 3$. 2 CD boxes counts as 2 CD. Special rates apply to larger box sets, please inquire. 12$ for 1st CD - for each additional CD add 3$. None(zero) of my customersso far has been forced tospend extra on customs dutiesor other government applied taxes. I always grade under a bright light from an angle. Like New(M-): Very near perfect playing surface and artwork. When held at an angle under extreme lighting you can see perhaps 1 or 2 very light scratches or pin dots. Good(VG+): No more than 10 very light to light scratches between 1/8" and 2". Artwork has case dents or a crease. Plays perfectly. Acceptable(VG): CDs in this condition are more for listening to than collecting. The disc is heavily scratched but can be played through without skipping. The booklet and inserts are present but heavily worn, and may include heavy fingerprints, bent corners, smudges, creases, case dimple marks, and writing.